Sitting between the great imperial nations of France and the Netherlands as it does, Belgium didn't	have much of a national identity until becoming independent itself in 1830. 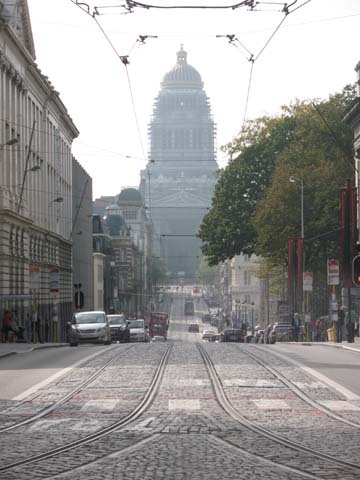 The country still has two	reasonably distinct halves; Dutch speaking Flanders in the north and French speaking Wallonia in the south, around the melting pot of Brussels in the centre. It is well known for many of its products such as lace, chocolate, waffles, diamonds, Tin Tin and Eurocratic bureaucracy. 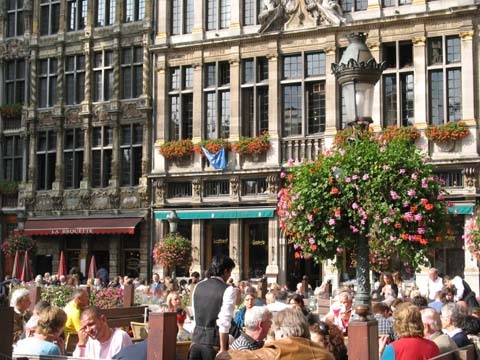 I visited Brussels for a long weekend from London, taking the Eurostar there and back. Belgium wasn't all that high up my list of places to go, but I did want to take a trip on the Eurostar and I'd been to Paris enough already. To my surprise I was very impressed with Brussels, there was much more to it than I'd expected and the city is truly beautiful. That said, it has its fair share of weirdos too, but it was good to see overall and I'm glad I've visited the capital of the United States of Europe. 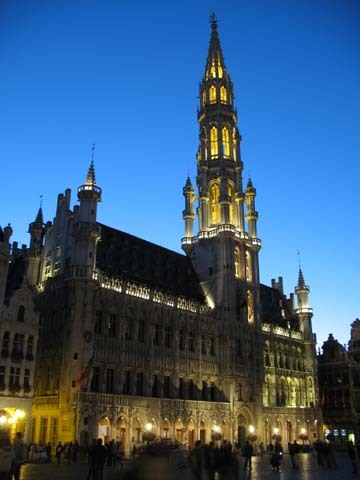 The centrepiece of Brussels is the stunning Grand Place, surrounded on all sides by dollhouse style	Guild Halls. Its encompassing nature makes it difficult to do justice by photography, so I took just	an element of it here, with the late summer cafes still in full swing. It certainly outdoes Madrid's Plaza Mayor for opulence. 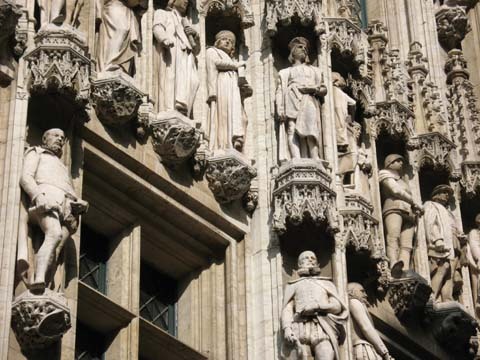 Statues adorn the fa�ade of the Hotel de Ville on the south side of the Grand Place, it is the City	Hall and certainly one of the grandest buildings I've ever seen. Just off the Grand Place is the statue of Everard 't Serclaes, who drove the Flemish from the city in	the mid 14th century. It is said that to touch his arm brings good luck, and there must be plenty	of lucky people around here because his arm has worn clean through. 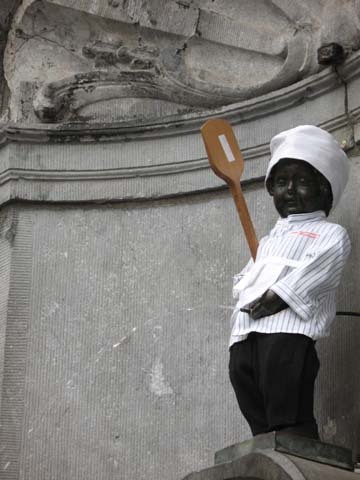 Perhaps Brussels' most famous attraction, and certainly among its cheekiest is the Manneken Pis, a small	lad happily answering nature's call on Rue de l'Etuve. He is regularly dressed up in an effort	to protect his modesty - today he was taking time out from the baker's shop. 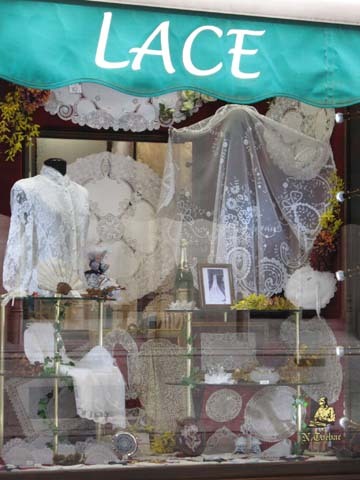 Belgium is famous for a number of its products, the first I encountered was Belgian lace. 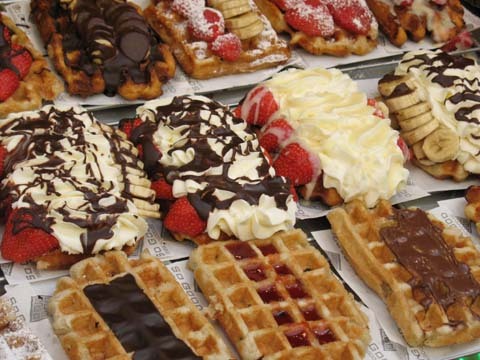 Shortly thereafter I came across a street vendor selling Belgian waffles - could I resist? Not a chance. 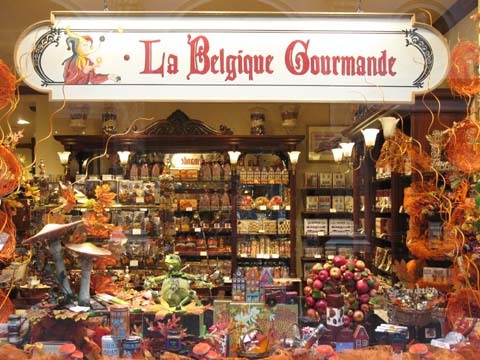 Belgian chocolate was next on the agenda, from the famous La Belgique Gourmande shop in the Galeries Royales Saint-Hubert. In the basement they have an odd museum featuring an entire avenue of Manneken Pis(s). 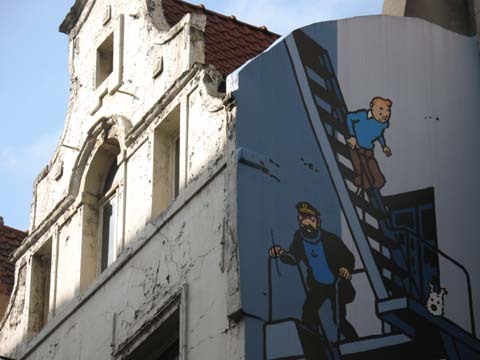 Belgium's most famous son, Tin Tin makes his way down the fire escape of this building in the mural on Rue de l'Etuve. 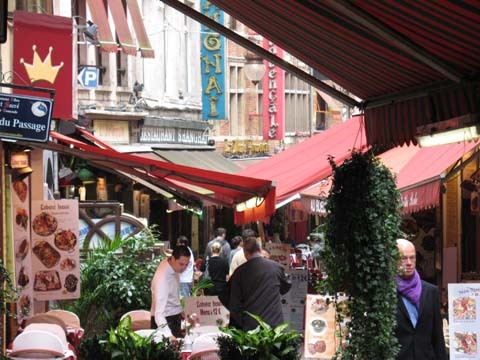 North of the Grand Place is a series of narrow streets hosting all manner of restaurants, but the best	choice has to be mussels in a white wine sauce from Chez Leon, all you can eat. 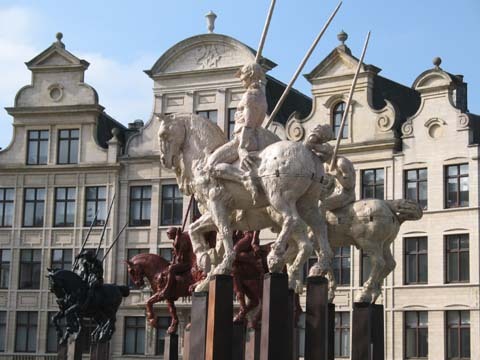 Horsemen stand on guard in Place de l'Albertine, up towards the Eurocrat district. The Palais de Justice caught me completely by surprise, I had no idea that Brussels hosted a building	such as this, on the scale of St Peter's Basilica in the Vatican. It was deliberately built very large	next to slum areas, to demonstrate the power and inescapability of the law. And lawyers wonder why they continue to be vilified? 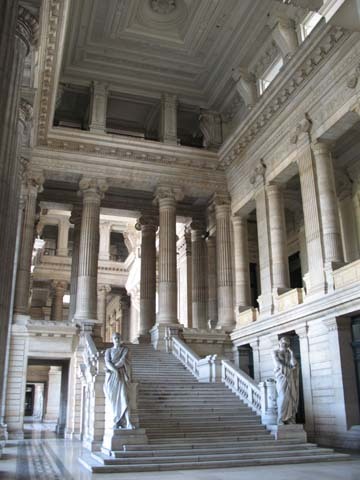 One of the entrance staircases to the Palais de Justice de Bruxelles. It's free to wander in and have a look around. 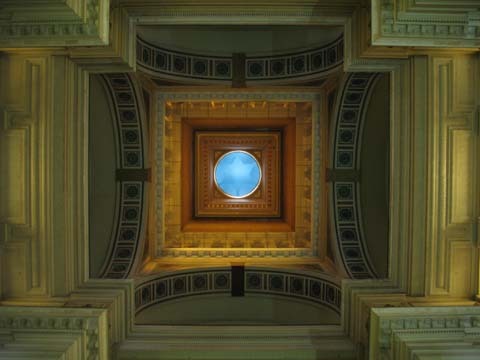 Inside the Palais de Justice, looking up at the central dome. The proportions of this building are	monumental, indeed it was the largest building constructed anywhere in the world during the 19th century. 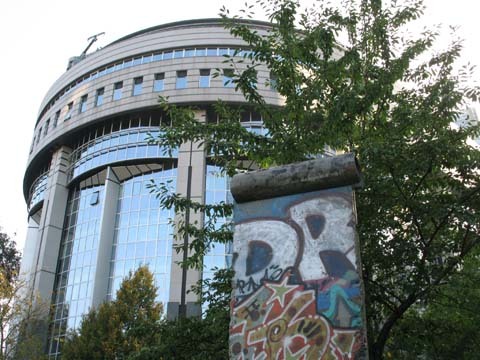 In the east of the city lies the European Parliament, the centre of the European Union. This complex	is called the Espace Leopold, and standing outside is a remnant of the Berlin Wall, complete with	grafitti. 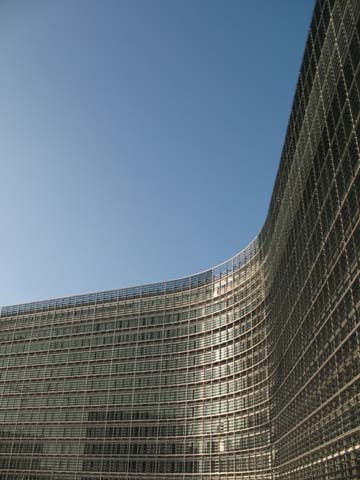 The European Commission Berlaymont building forms a glass and steel curtain around Schuman metro station. It is where the representatives from each of the member states get together, but commissioners	are bound to act independently and are not affected by their own home governments. 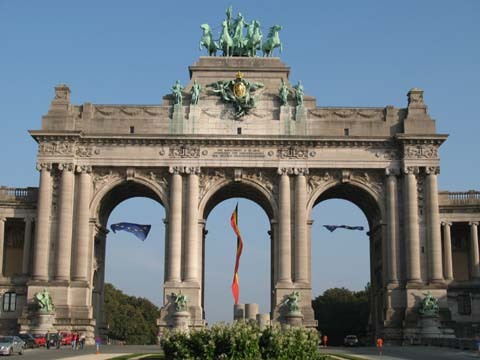 Belgium has its own triumphal arch, the centrepiece of the Parc du Cinquantenaire in the European Quarter	of Brussels. It was built in 1905 at the time of the 75th anniversary of Belgian independence. 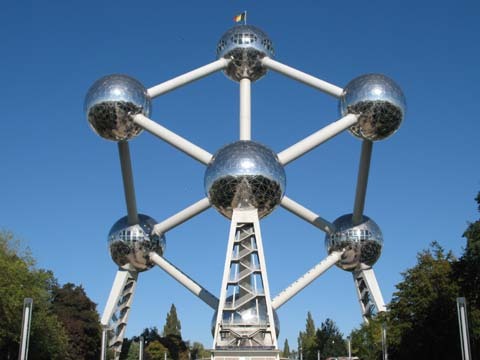 The Atomium is another of Belgium's most famous icons, and was built for the World's Fair in 1958. In the mid 2000s it was given a very shiny makeover, and now looks great glinting in the sunlight. 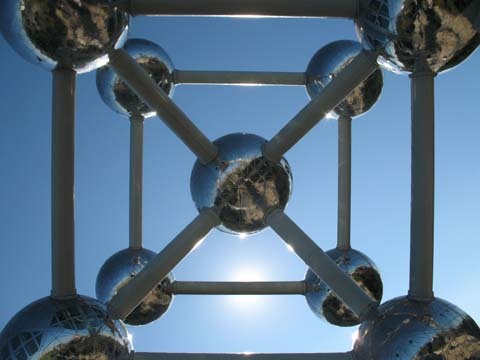 The Atomium is a representation of an iron crystal structure, body centred cubic for those of you familiar	with metallurgy, and magnified 165 billion times. 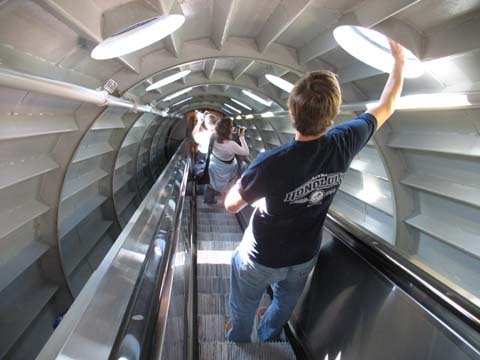 It's possible to take a lift up to the top of the Atomium, and to traverse the chemical bonds by stairs and escalators. 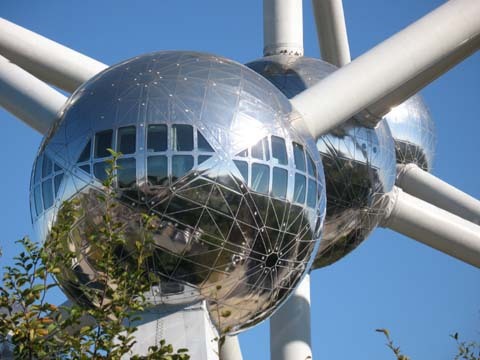 A close up view of three of the stainless steel clad Atomium pods, each one 18 metres in diameter. 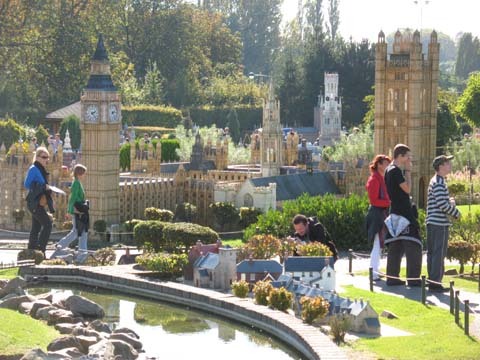 Mini Europe model village does just what it says on the tin, and represents all member states of the European Union in miniature. Some of the newer members are perhaps a little under-represented however. 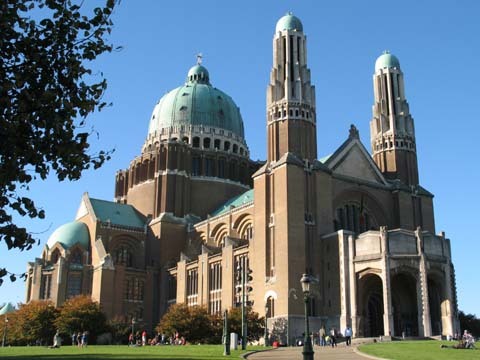 In a western district of Brussels looms the giant Basilique de Koekelberg, the Basilica of the Sacred Heart. It ended up looking very different from the original gothic plans, as its construction was interrupted by two world wars. The final art deco style is unusual for a basilica of this size. 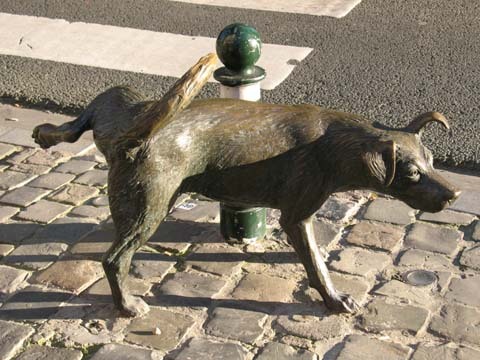 Back in town I came across this dog in effigy marking its territory. 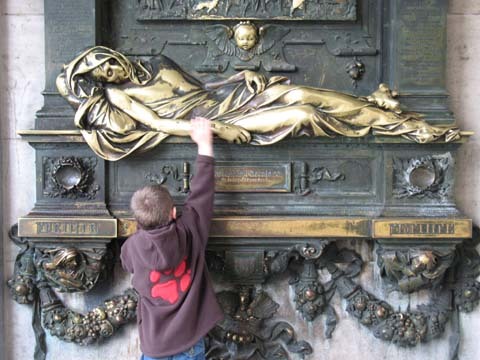 Zinneke Pis is one of the relatives of Manneken Pis, the other being his sister Jeanneke Pis who squats in a lane near Rue des Bouchers. Night view of the Grand Place, with the Hotel de Ville dominating the scene. Truly this is one of the most beautiful squares in Europe. 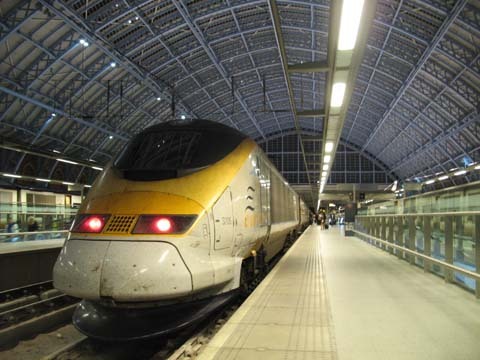 At the end of my trip, I headed back to the UK in the comfort of the Eurostar, the high speed rail link	which took me through the Channel Tunnel and back to London St Pancras station from Brussels-Midi/Zuid in less than two hours. Fantastic.